This fall I have been discovering all sorts of wonderful new fruits and vegetables, as well as enjoying the heck out of some older favorites. The grocery downstairs started selling some interesting-looking grapes recently and once I found out what they were and tried some I was definitely hooked. That's, uh, not a maple leaf. It's a grape leaf. Just pretend, ok? Muscat grapes, also known as muscadines, are big spheres of tasty juiciness. With a tart, tight skin and sweet, nearly gooey flesh, they’re almost grapier than grapes. The grapes come in both red and green varieties, with the reds generally being sweeter with fewer rock-hard (bitter if you accidentally bite them) seeds. I like the red ones as a little dessert but prefer the green in general for their more intense flavor. Muscat wine is a common use for the grapes, which are hard to snack on as easily as table grapes due to their tough skin and lurking seediness (though a dedicated fruit lover like myself will have no issue eating them plain, as long as there is a place to spit the seeds). 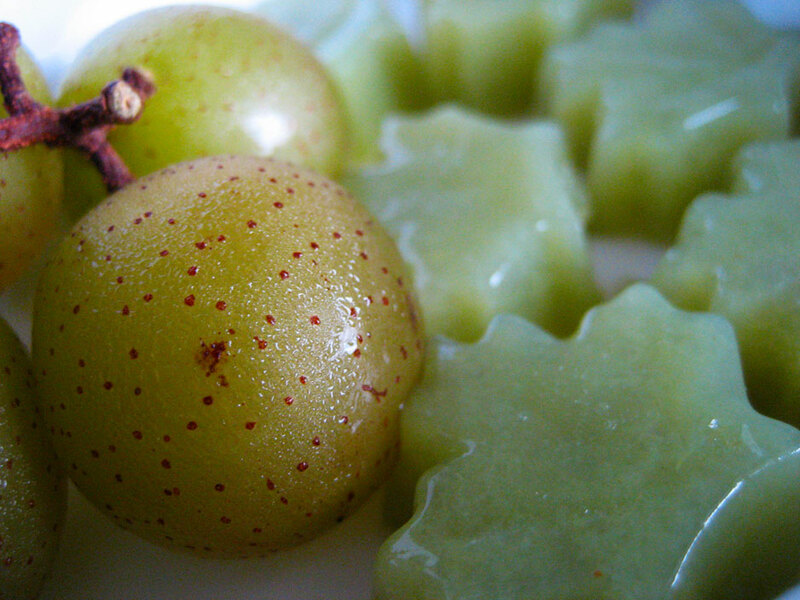 Up until I found the grapes fresh, however, I’d only experienced their flavor in a Japanese jelly candy. I decided to play off that general idea and came up with these. Not as squishable as other jellies. I had a couple sticks of agar agar hanging out in my pantry so I figured I’d try making my own muscat grape jelly candies – vegan, sugar free and almost fat free (completely fat free if you have a silicon mold!) I had never used agar agar before so I read up a bit and found that it’s some powerful stuff, and too much in a recipe will result in an unpleasant grainy texture when eaten (which explains the tremendously disappointing vegetarian Jello I once ate). I decided to use a ratio of 5% agar to fruit puree, though you could definitely get away with a little less – as low as 2 or 3% probably, though you’d have to be more careful when unmolding. Or just gel it in fancy glasses like Jello. I did include green food coloring because the puree will oxidize and turn a little brownish very quickly. 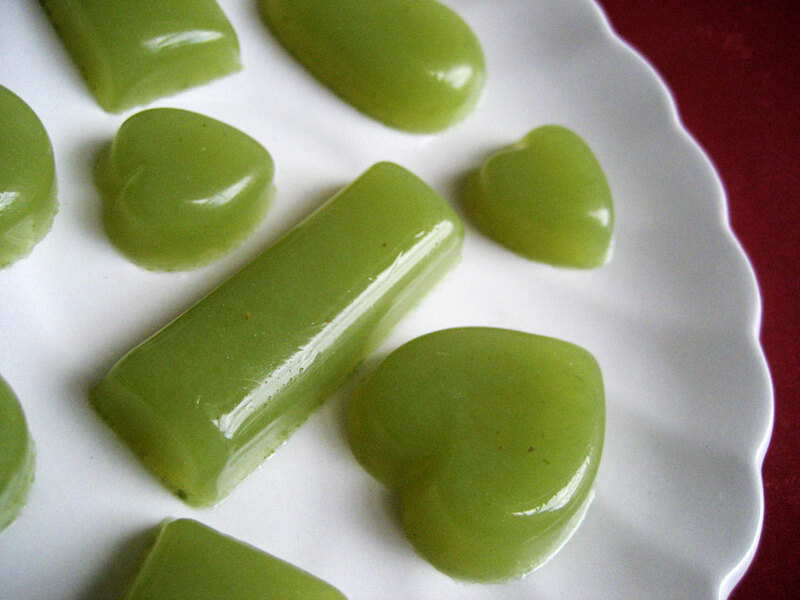 You can leave it out but your jellies may look a little sad. Another thing to note is that since these are completely plant-based and naturally high in water, they will mold rapidly. Eat them within 2 or 3 days, and keep them wrapped tightly in plastic. You could get a few more days out of them by refrigerating, I’m sure. Also, if you make these, for the love of all that is holy, line your strainer with cheesecloth. It’s no fun trying to scrub the grapey residue out of your poor abused strainer. And finally, there is absolutely no reason why this is in grams, besides grams being the preferred measurement at school. My scale was still set to grams and I was too lazy to press the button once to switch it over. Just remember the ratio and you can use whatever unit of weight you like. Behold my obelisk of plant matter! Prepare candy molds – if they are silicone, just set them out for use; if they are plastic, ceramic or any other material that is NOT non-stick, oil them lightly with cooking spray or a quick swab of neutral cooking oil. Cut the agar stick(s) into one inch chunks with scissors and place in a bowl of cold water, letting them soak for 5-10 minutes. Pour the puree into a large saucepan. Once the agar is sufficiently hydrated, squeeze the excess water from the chunks and add them to the pan. Cook, stirring gently, over low heat until the agar agar is completely dissolved. Add the food coloring and stir until it is completely incorporated. Remove from heat and immediately pour into prepared molds. Pop any large bubbles with a toothpick or via gently shaking the molds. Let cool and set up – it will take less than an hour. Once they are cool and firm to the touch, pop them out by bending the molds, if flexible. Some basic shapes, in non-flexible molds, will pop out with a little pushing back and forth. I had to use toothpicks to carefully poke around some corners on my leaves to loosen them but they came out pretty easily after that. Of course you can bypass all that fiddly nonsense by pouring the mixture into individual shotglasses or other glass serving vessel and serving like Jello. These were quite tasty and the flavor came through really nicely – no spitting needed! Since I had never worked with agar agar before and the instructions on the back of the package were garbled and/or in Japanese, I decided to treat it the way we do gelatin sheets in class – with a cold soak, squeeze and melt. Very cute. 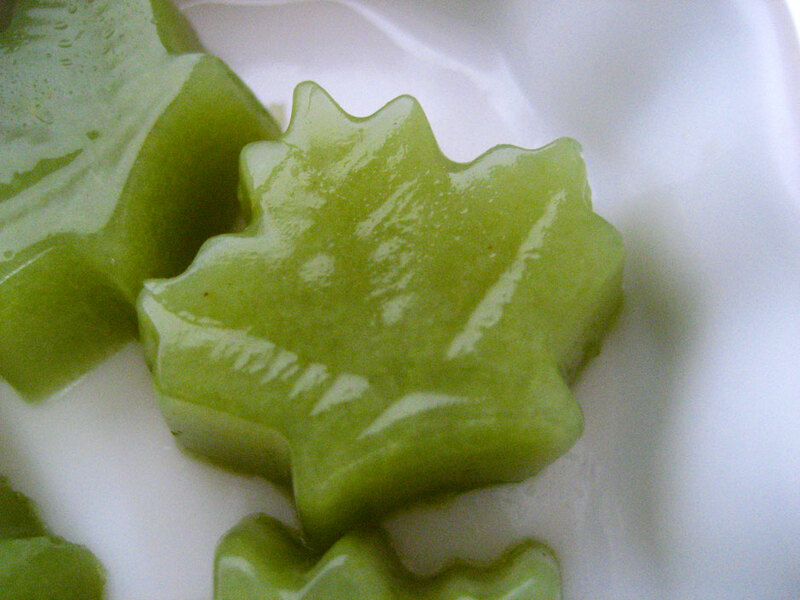 I’ve been mucking around a little with agar to try and use for vegan fondant and it really doesnt seem to behave quite the same as gelatin, its more grainy and just not as flexible, but your jellys seem lovely. I’ll have to have another try with it. Down south where I live you can find both muscadines and scuppernogs in the markets in the late summer. Both are hard to eat but the juice and wine (and jelly) I’ve tried have been delicious. I played around with xantham gum when making vegetarian marshmallows. I wonder if that would also work to make jellies? i love the color of those grapes! lovely. Hmm…I’m not sure whether I am more envious and eager to try a muscat grape or those muscat jellies! I’m definitely interested in experimenting with agar now. 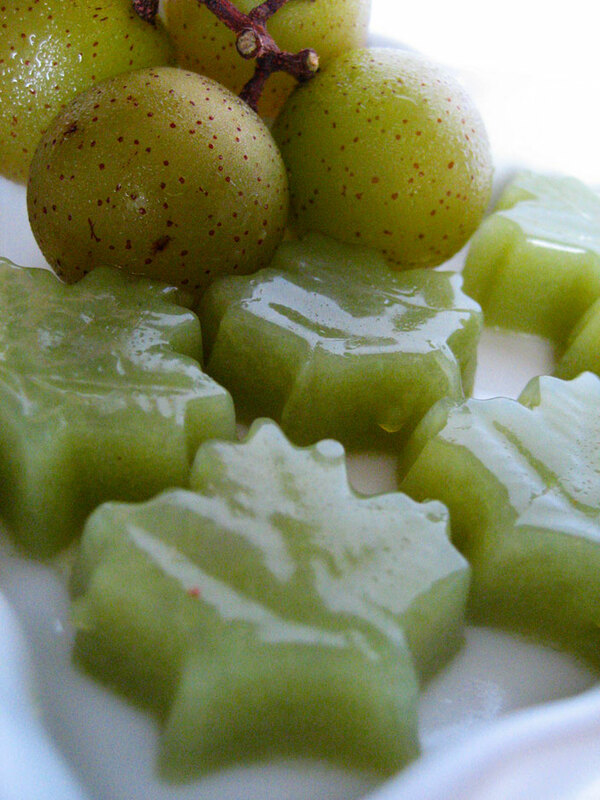 I am so impressed by your creativity in creating a recipe around the grapes–well done! 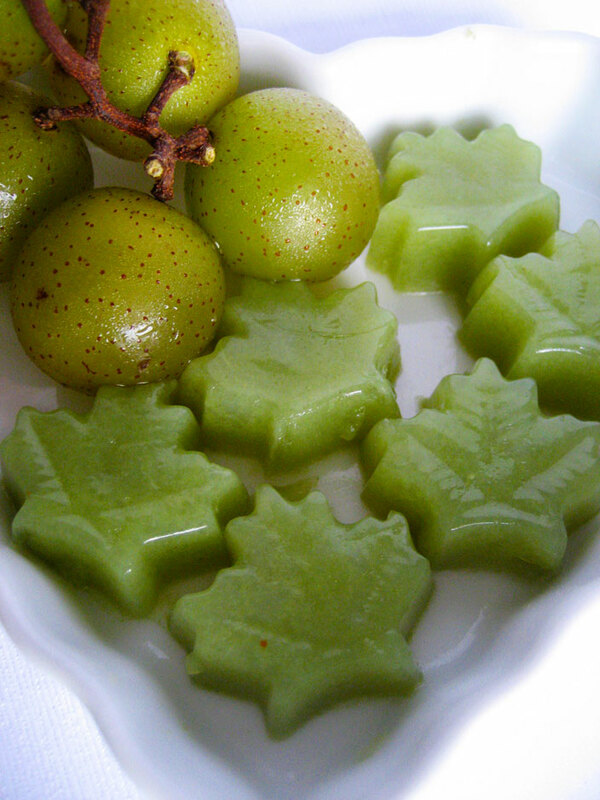 Thanks for introducing me to a new grape, now I’m curious, although not that big a fan of seeds :| But the cuteness of these jellies is too tempting!